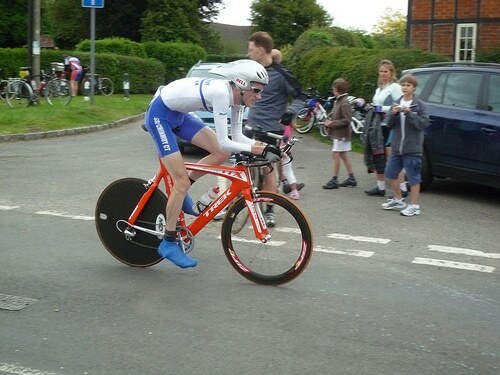 The British time trial championship has been held annually since 1997. Originally a joint CTT / BC promotion, it was for a while it was also called the Circuit championship (to distinguish with long standing CTT championships of 25 miles, 50 miles e.t.c) In the past few years, it has been run solely by British Cycling to ensure the best spot in the calender so that Pro riders can make sure they can enter, and pick up any precious UCI points on offer. In the domestic time triallist calender, this is the big one. A chance to compete against all the pros. This year there was a certain logic to me not entering the British Time Trial Championship in Wales this July – My bike is of dubious UCI legality; I sold my only UCI compliant tribars, and it’s a hassle to get another pair. Then there is the cost of BC license, new tribars e.t.c., and I’m up in Yorkshire that week e.t.c., e.t.c. Yet, although there is a logic in not entering, I still feel a pang of regret when I see the startsheet. – especially after learning how hilly the course is. The startsheet shows the strength in depth of British cycling; even in the absence of Chris Froome, it’s probably one of the strongest time trial line ups in Europe. It also shows the unique nature of the sport of cycling, that you can still rock up alongside people who you watch and admire on tv and get to partake in the same race as them. These are some past experiences of riding the British Time Trial Championships, now organised by British Cycling under UCI rules. In 2005, I finished 14th, five minutes behind the winner Stuart Dangerfield in Penistone, Yorkshire. It was very hilly race and my first season of racing. After the first lap, I was in a ridiculously high position after storming up the hill as if it was a 5 mile prologue. I blew up spectacularly, but for one lap out of three I was riding with the best. In the absence of any expectation, I enjoyed it all tremendously. It was the first race my mother came to watch and she said unlike everyone else, I never braked to go around a corner she was watching from. I’m not sure whether she said this as criticism or as a complement. I finished near last in that race. I wasn’t in good form, and not racing much that year. I also got lost and took a wrong turn at a roundabout; at least it was a good excuse for a dismal performance. The only thing I remember about that championship was that I even turned up on the wrong day (arrived on Sat, to learn it was on the next day Sunday). Fortunately, it wasn’t too far from Oxford. The third championship was on local roads near Buckinghamshire. Bradley Wiggins, after finishing 4th in the Tour de France in July, stormed around the course to win in 1.02. I was a good nine minutes behind in 28th place; it was one of the few races I managed that year, but it was still good to participate. A pre wind tunnel position. There’s a minute right there. 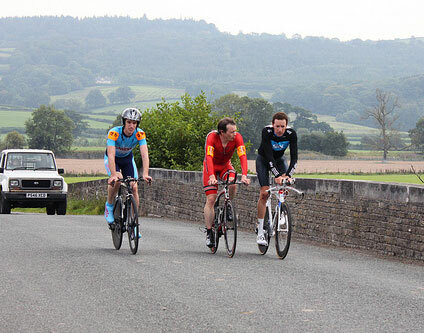 Wiggins, Hutchinson and an unknown club cyclist riding together. The fourth championship was in Wales (2010) My greatest claim to fame was get overtaken by a then relatively unknown Chris Froome. I thought I was flying along a road at 30mph, when this Sky rider came flying past 4mph quicker. I wouldn’t have minded if it was a well known Sky rider like Bradley Wiggins or Geraint Thomas – not some unknown domestique who was probably going to lose his contract at the end of the season. For the record Chris Froome finished 2nd, one minute behind the champion Bradley Wiggins. Those who say Chris Froome never did a good time trial before 2012, obviously were not overtaken by a flying Froome in 2010 at the BTTC. 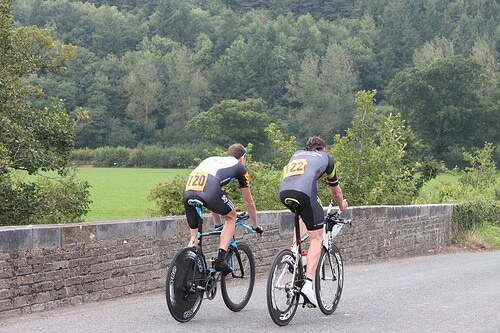 After the finish, I sneakily went back with a camera to take a few shots of the big boys finishing. I got a great photo of Michael Hutchinson talking to Bradley Wiggins, perhaps they were discussing a rematch on a London hire bike. As I was riding back a young Geraint Thomas rode past me. I would be too shy to start talking to a famous cyclist, let alone ask for one of those selfies which seem to have taken over from autographs these days. But, Thomas was very generous and open, he started chatting and asked me about my cycling. I told him I was going to do a 100 mile time trial. Thomas replied. ‘I couldn’t do one of those, I’d need my brain removing!’ Good job Thomas didn’t stick with domestic 100 mile TTs and went to ride the Tour of Flanders and Paris Roubaix instead. It was a small gesture to talk to an unknown club cyclist, but it was good to realise the Team Sky Pros, are just like us – except perhaps 70 watts faster. When I got back to the HQ I saw my number had been chosen for a random dope test – with a stern warning riders were to report within 30 minutes of finishing. I worried in stopping to take photos and chat, I may be late. Doping and dope tests all felt like another world. I rushed to the doping control, but when I turned up all excited at getting to provide a sample of the finest amber, the controller looked at the results sheet and said not to bother. I was a bit deflated; my first dope test and they didn’t even want it. That day I finished 24th, nearly 9 minutes behind Bradley Wiggins. 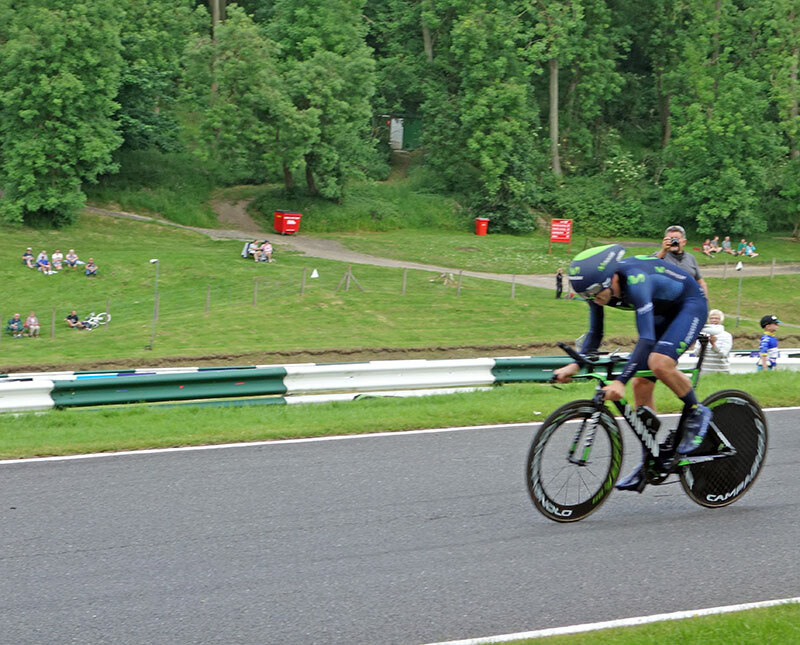 In 2011, I had my best performance and finished 10th 1.04.41 (27.2mph), just six minutes behind Alex Dowsett. It’s a shame it was Cambridge and not something hilly. I even have a momento of that championship – UCI rules and regulations meant I had to saw off the front of my saddle to meet some rule about bottom bracket distance. I still don’t understand the rule, but I just used a pair of scissors until they let me race. In a strange way I quite enjoy looking at the saddle with a sawn off tip – It’s kind of a homage to Graeme Obree – the ultimate paradox for Swiss UCI regulations. Since the event has been run by British Cycling, I’ve never got my act together to enter. It’s a shame because I’m probably in better form now than in previous years. If I entered now, perhaps my losing margin to Bradley Wiggins would be slightly smaller than it was in the past. Anyway, good luck to those entering, 2014 will be very interesting to see how the domestic testers get on against the world’s best. the irony is that my form seems to have upped sticks and left, just when i needed it most.